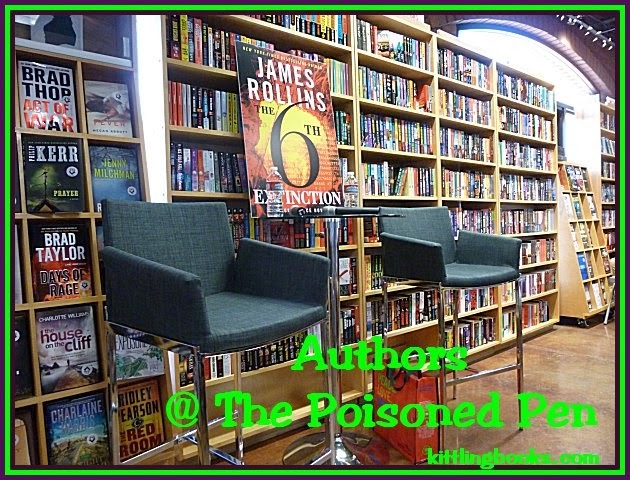 Stephanie Barron and Charles Finch at The Poisoned Pen! Saturday, November 22, found me at my favorite bookstore-- The Poisoned Pen-- witnessing a scene of such awesome book-related cuteness that it plastered a big old smile on my face for the rest of the afternoon. A mother brought her five-year-old son into the bookstore because he wanted to look for books. Most of you who've never had the good fortune of visiting The Poisoned Pen may think that it only carries crime fiction. Au contraire, it carries a little something for everyone, including a nice section for children. This little boy held each book as if it were the rarest treasure, and I learned that his favorite was Pat the Cat. But it was when his mother found a signed copy of a book that I fell facelong into terminal smile. She saw the "Signed Copy" sticker on the front of the book her son was holding. She turned to the page with the signature on it, and said, "This book is signed. Do you know what that means?" The little boy shook his head and said, "No." "It means that the person who wrote this book signed his name right-- here -- on this page." The little boy ran his fingers across the author's signature, and sighed the quietest and most reverent "Whoa!" that I've heard in decades. Shortly afterwards I spotted Charles Finch talking to folks up front, and then Dana Stabenow breezed into the bookstore. Come to find out, she'd just arrived in Phoenix a short time before, and The Poisoned Pen was her first stop. She and another woman were talking about Buffalo being buried under snow, and Stabenow looked at me and exclaimed, "The dumbest thing I've done all year is put studs on my truck!" Evidently not a single flake has fallen in Homer, Alaska. With the further arrival of Barbara Peters and Stephanie Barron (and egg nog made by Barbara's husband Rob), the bookstore became a beehive of activity. I thought that it would be difficult for that afternoon's authors, Stephanie Barron and Charles Finch, to top that little boy, but they did manage to pull it off. 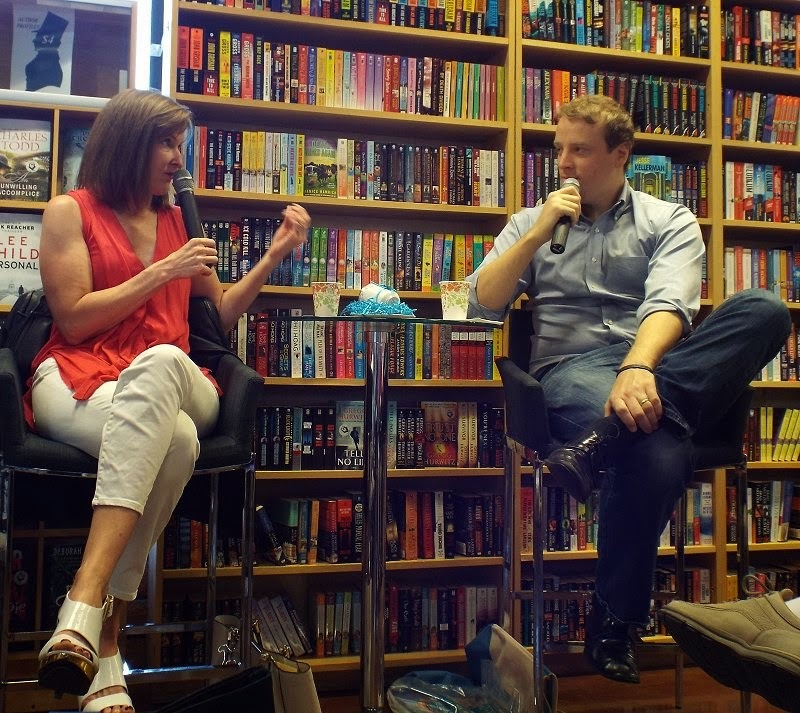 Never underestimate two authors who love what they do! The event hadn't even begun when Charles Finch warmed our hearts. He was asked what he thought of the Phoenix metro area, and he told us that he really couldn't say much about it; he was only in town for this event and would be flying back home afterwards. Why? Because he has a six-month-old baby at home, and he couldn't wait to get back to her. You would've had to have been dead not to be touched by the look of love and pride on his face. Barbara introduced two of her "favorite British authors" whose series are roughly sixty years apart. Stephanie Barron, whom Peters called by her real first name, Francine, because Barbara couldn't "make the jump," writes a series of books featuring Jane Austen that take place during the Regency, and Charles Finch's Charles Lenox series takes place in the 1860s-1870s. Peters then formally introduced Finch, whose character in his latest book, The Laws of Murder, has left Parliament and opened a private enquiry office. "These two know each other, like each other, and have read each other's books, so as a treat for you, I'm going to sit on the sidelines and let these two talk with each other," Barbara said, handing her microphone over to Stephanie/Francine. The very first thing Stephanie asked Charles was what made him focus on that time and that character. "The books I really loved to read, from the ages of fifteen to about twenty, were Anthony Trollope and Elizabeth Gaskell," Finch replied. "The Victorian Era isn't as sophisticated as Jane Austen..."
"What about Middlemarch?" asked Dana Stabenow from the back of the room. "That's a good point," Finch said. "Do you want to come up and talk with us?" Everyone in the room broke into laughter as Barbara tried unsuccessfully to give Dana her seat at the front. "Anyway, to get back to your question, I majored in history in college, and I was fascinated by the disconnect of the image I had in my mind of the Victorians, which was of an incredibly staid, rigid people, and how they really were. The span of Victoria's life is one of the greatest periods of social change there's ever been in the world. At the beginning of her reign, suicides were still being buried at crossroads with stakes in their hearts. When Victoria died, we were ten years away from universal suffrage. I wanted to write about all those changes that occurred under the placid surface of bankers in Hyde Park." Finch then asked Barron-- as the writer of a long series-- how she managed to keep writing because sometimes he found himself wanting to quit. "I think it helps to-- as both of us do-- invent the books within the history of the time because no matter how tired you become of your character, or in my case her family, the context is so compelling," Stephanie said. "When I was researching A Flaw in the Blood, it was fascinating to me to see how Albert had changed the face of London as compared to the way it was during Austen's time. The subway system, the sewers, the rivers forced underground and being paved over, the Thames Embankment...."
At this point Finch was nodding enthusiastically. 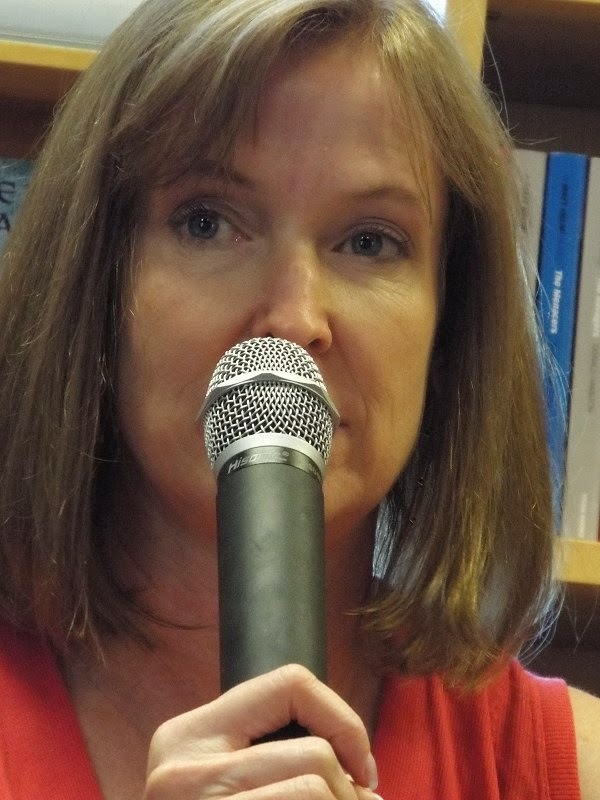 "I've come to the point where research-- and editing-- are my favorite steps in the book process. If only I could find a way to eliminate that middle step!" Both authors spoke about writing "at the end of history"-- being able to look at the ways people thought they were being modern from our own point of view. This led Stephanie to talk about Jane Austen's sister Cassandra. In Jane's private letters to her sister, the reader can see that she is a witty, earthy, sometimes vicious commentator in her letters to her sister. Cassandra lived long enough into the Victorian Era to become ashamed of Jane. Some letters Cassandra destroyed entirely, but she took her embroidery scissors to others and snipped out any passages she thought to be offensive. "Some look like Swiss cheese," Stephanie said. 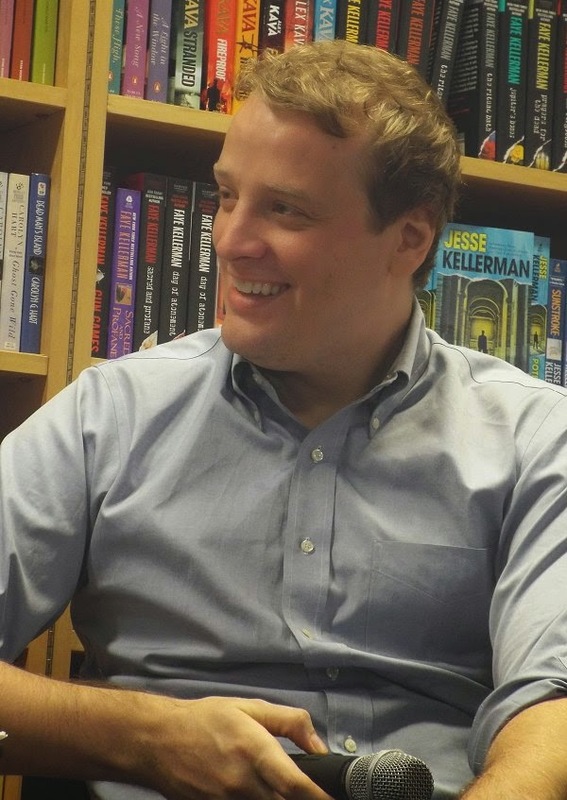 "It's terrible, but it's a huge opportunity for someone who writes fiction, because where there are gaps in the letters, I put fiction, and that's been really fun for me. I thoroughly enjoy doing this with people who have lived in the past." 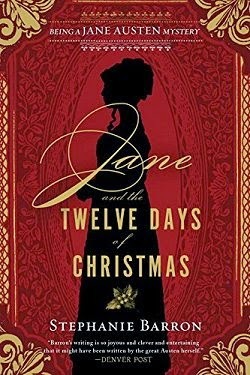 "One of the reasons why I found reading Jane and the Twelve Days of Christmas so interesting is the uncharitable but perfectly honest thoughts Jane has about her brother James and his second wife, the drama queen," said Barbara Peters. "You had a wonderful time unleashing yourself as Jane upon two members of her family who thoroughly deserved the portrait you're giving them." "Jane was quite adept at caricature," said Barron, "and her writing is quite pointed and even vicious in her depictions of certain characteristics of people in society. I think that's a large part of why she wrote. It gave her power as a woman who was somewhat powerless. She had no husband, she had no income to give her stature in society, but she had her pen. I think her social commentary is one of the reasons why we still read her today. We recognize her characters." "This book was purposely written as a country house murder," Stephanie continued. "It was nice to be able to put characters in a country house where they couldn't leave." "Writers love to come up with new ways to lock someone in a room!" Charles added. "I wrote a book called A Burial at Sea for the very same reason. I need to actually lock someone in a room sooner or later, but it hasn't happened yet." 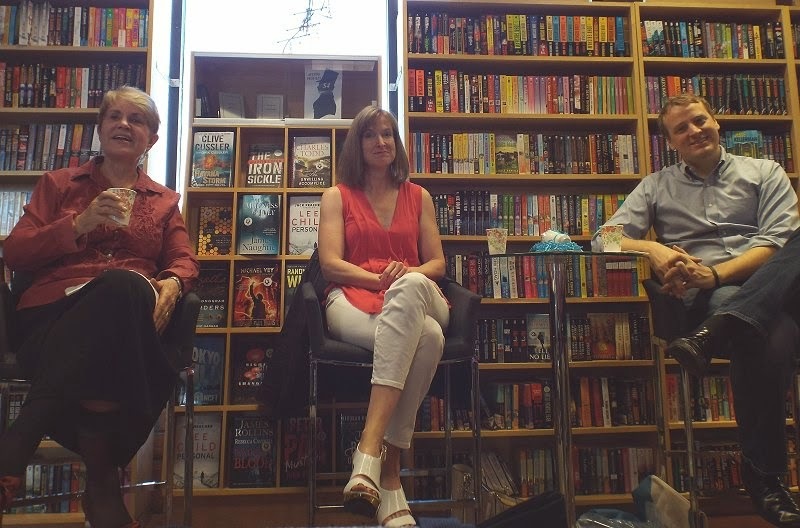 "I once started to write a book set on a container ship," Stephanie said, "and I finally had to throw the whole thing out because I couldn't get the characters off the damned ship-- and it just seemed very constraining! How did you handle that?" "I don't know if I did that good a job to be honest," Finch replied, "because I put them on shore in Egypt after 200 pages. In many ways this book was the most fun for me to write because I love the books written by Patrick O'Brian and C.S. Forester. So there's an element of straight homage in that book that isn't in any of the others, but yeah, just get him off the boat! After awhile it becomes claustrophobic." Barbara Peters asked Charles what was going on. 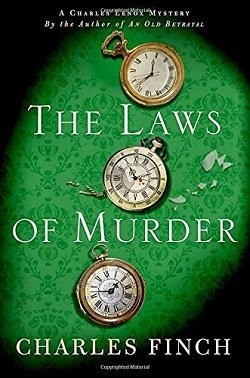 He'd had an entire story arc about his main character, Charles Lenox, being a member of Parliament, but in his latest book, The Laws of Murder, he is no longer. "This is really embarrassing," Finch said, "but there was a comment on my Facebook page from someone who said he was so sick of Lenox being in Parliament, and he wondered why the character couldn't go back to being a detective. I said, 'You know what? I'm sick of that, too!'" "Well, to get him out of Parliament, you put him in a rather interesting situation," Peters remarked. "I wanted to beat him up a little bit because I think his life has been so good. I wanted to give him something to make him grow, for him to be a little less glib. I feel freer now to talk about class differences and other issues now that he's no longer in Parliament." Peters brought up the fact that Lenox and his wife both have private incomes, so Lenox does not have to work. "One of the things I did that gets commented on all the time is when I had these two characters get married, they were living side by side in separate townhouses, and they hired an architect to join the two houses into one. I've had more people tell me that, if they had taken on a huge architectural project like that, they would've been divorced in two weeks," Finch laughed. "I've also been told a lot about fans' personal renovation projects." "There is an actual mystery plot, and it's an interesting situation that Lenox gets himself into," Peters said. "What happens?" "Let's see... I'm writing one now... we're talking about the green one, right?" Finch said, making us all break into laughter again. "A member of Scotland Yard is murdered who's been friends with Lenox. I've always liked the CSI model where someone who's insane goes around killing people. 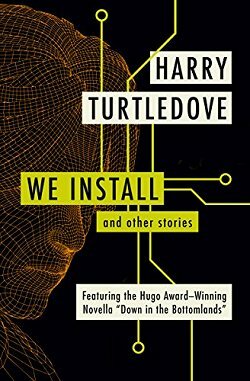 I've never written about a crazy person before, so I created one, and he's the first suspect when this Scotland Yard detective is killed. "Honestly, this is my favorite book in the series," Charles said, looking at Stephanie. 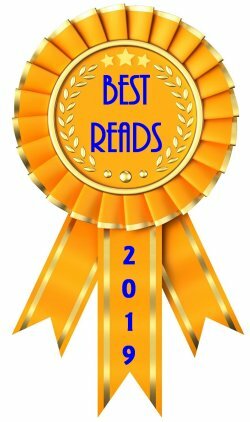 "I don't know if you've ever experienced this, but I can't even open and read the first two books in my series because I feel I've improved so much since I wrote them. I know that sounds so arrogant." "I know exactly what you mean," Stephanie replied. 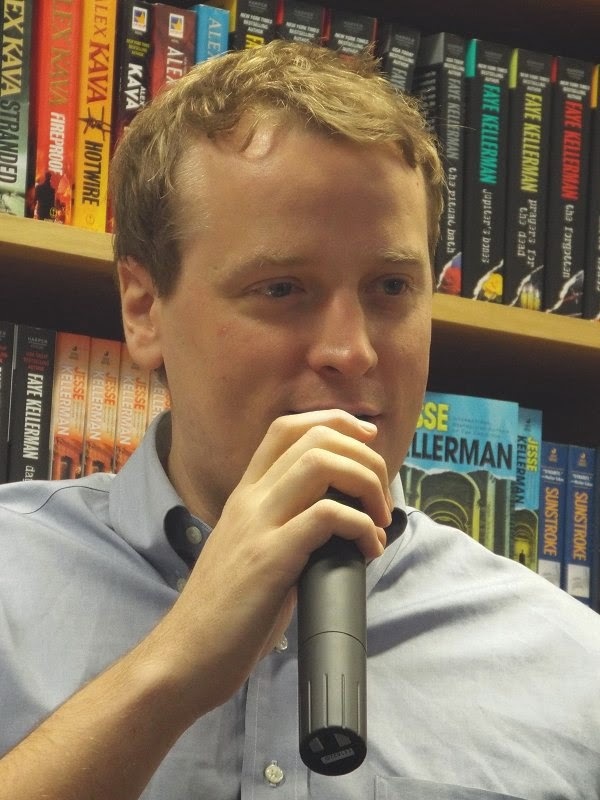 "In fact, since it's such a long series I've had people ask me if they should start with the first book, and I tell them to begin with book number two because I feel much more comfortable with that one. I was very much attempting to write a Jane Austen novel with the first one, and I did sell it, but it was an exercise to a great extent-- in speaking in her voice as well as in other ways." Talk between the two authors segued into killing off beloved characters, like Elizabeth George had done in her series. Stephanie said that she had killed off a character before, and then Charles jumped in with "I killed a cat in one book, and I wish I'd never done that!" 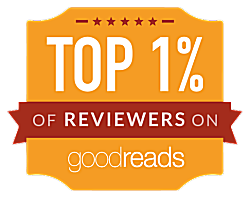 Another segue into why Jane Austen never married, to Charles studying in Oxford for three years, to opinions on reviews.... The talk was fascinating, and if you want to hear every word of what was said, I really encourage you to check out the event on Livestream. Conversation moved to doing research. 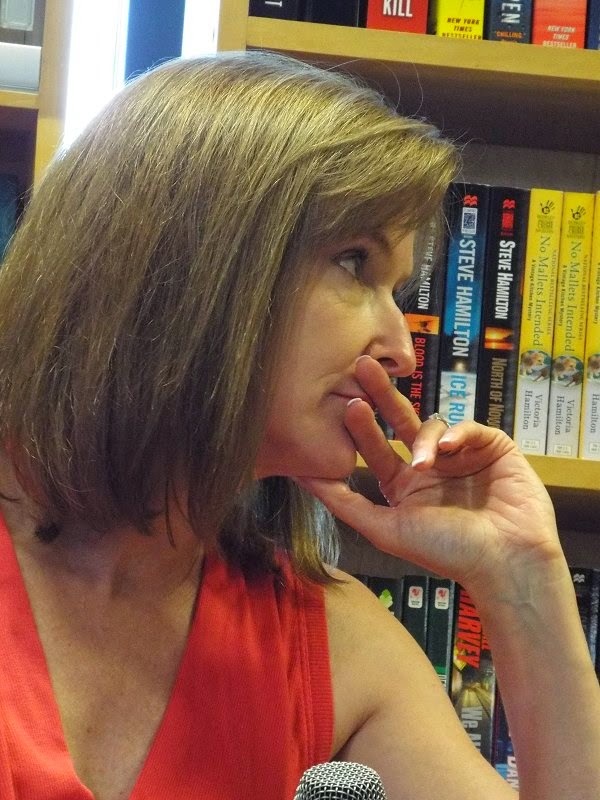 Stephanie Barron writes Jane Austen mysteries, but under her own name-- Francine Mathews-- she's a former CIA analyst who writes standalone thrillers with historical settings. She talked a bit about doing research in Vietnam in 1999 when the area was hit by a massive typhoon. In almost complete contrast to Barron, is Charles Finch, who goes to England once a year and lives in Chicago the rest of the time. "I've never lived in the country; I'm scared of it," he admitted, yet both authors are aware of how important atmosphere is to a book, where one small, telling detail can put readers right in the middle of a scene. 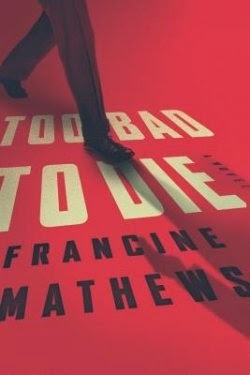 Barbara Peters had a reason for bringing up research and travel: Stephanie-as-Francine's newest book which will be released on March 3, Too Bad to Die, in which British Naval Intelligence officer Ian Fleming attempts to foil a Nazi plot to assassinate FDR, Churchill, and Stalin. "I loved all the information crossing my desk, but I hated the constraints of the job," Stephanie said of her work for the CIA. "It wouldn't matter if I were selling widgets, I just hate the idea of being stuck in a job from 8 to 5 everyday. I wanted to work at home doing my own writing on my own terms. When I was working on my doctorate in history-- which I did not complete-- it became very clear to me that what I love about history are the personal stories. The idea that history is individual, that events change due to personalities, which was very unpopular in the field at the time. "I think spy novels haven't been very good since the end of the Cold War," Charles Finch observed. 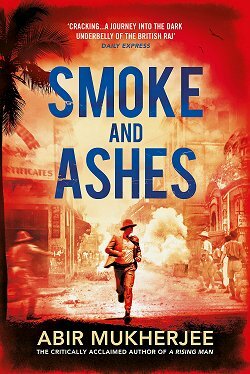 "It's just not the same to me when a spy novel is set in Afghanistan." Stephanie agreed. A short and interesting question and answer session followed before we all adjourned to have our books signed and to drink more of Rob's delicious egg nog. This event ran longer than most, mostly because these two authors were fascinating, and we loved hearing all the information they were so willing to share. It's wonderful to be able to attend events like this and learn tons of insider information! I love your 'field reports' from PP, Cathy!! It sounds as though this was yet another winning evening!! It certainly was, and that little boy was the perfect beginning! Luv your blog. Would like to put it in my pocketbook and carry it places. Why thank you! I'm so glad that you enjoy it.